"I may only have a brain the size of a peanut... wait what was I saying again?" Rather than bore you with a long life story, I thought I'd share some of the memorablia I've collected from my many adventures. 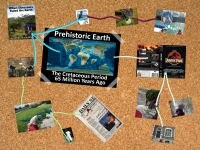 As I'm really big on geology, I thought I'd set up my memory board as a rough Timeline of my existence. If you are interested in any of the items or topics on my board just click on their picture and check out any related posts (some are still under construction at moment...). Like all (good?) stories mine has a beginning. 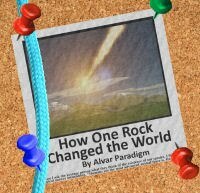 Only unlike most others that claim it, my story really does start a LONG time ago! 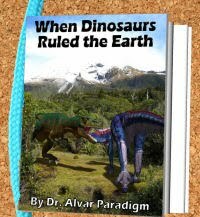 When Dinosaurs Ruled the Earth!!! It was back at the hey day of my kind that I originate from. 65 million years ago during the Cretaceous period, to be precise. 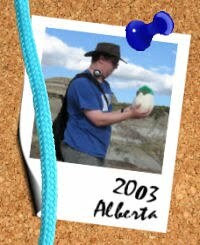 Now I can't tell you details about it, for obvious reasons, but my egg was lain in prehistoric Alberta. Yet somehow I survived, after a fasion. My egg was buried, but despite all logic this did NOT kill me. Rather put me into a slumber through the ages (and pre-ages!). Millions and millions of years. You know come to think of it, I was really bored!!! 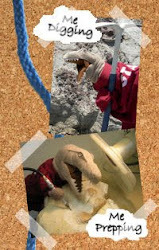 My discoverer was a tour guide named Craig who fashioned himself a palaeontologist. However up until the day he found me, his ambition hadn't gone so well. I wonder if he wishes his luck hadn't changed after finding me? i would encounter my mother, after a fashion, only she'd been long dead. only her skeleton remains today, but i guess it's better than nothing. 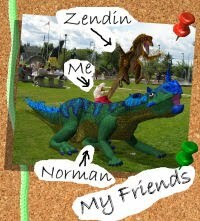 When I finally met and made friends with some other Dinosaurs, I of course picked the oddest Dinosaurs a T-Rex could hang out with! Naturally while at the Tyrrell I picked up some scientific know how and skills! 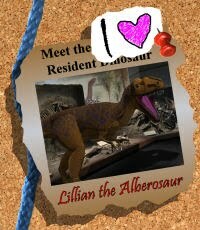 I fell in love with the museum's star attraction, Lillian the Albertosaur... Not that she returned the feelings back in those days! 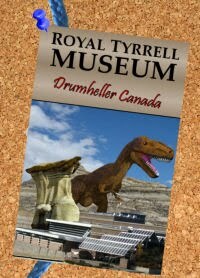 Unfortunately Drumheller was just overrun with other Dinosaurs. So I wasn't going to be able to stay there, and make a name for myself. 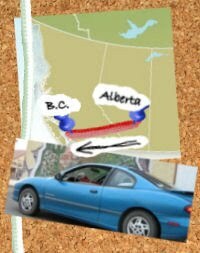 I travelled across BC thinking I was travelling back in time. Only later would I find out BC in Canada stands for British Columbia! I'm a big deal to the Government! 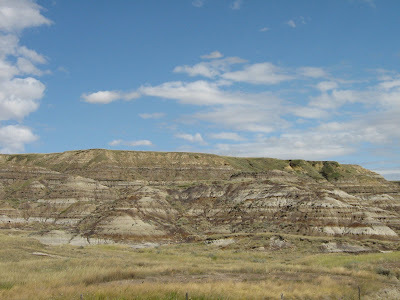 there i was, out in the badlands around huxley alberta (a small town about an hour north of drumheller) with technician extraordinaire darren tanke looking at the VERY spot i was discovered at! now that i'd seen where i'd hatched at, there were some other big questions to answer. the biggest at moment: who was this francis slate guy? well again i was with darren. a man who for over a decade now has made it his mission to track down all the dig sites in alberta. known and unknown. he has developed killer methods for finding them too! when i informed darren, i intended on helping him track down this francis slate, we both agreed i'd probably need a bit of training in finding lost quarrys first. now as i was about to learn from the master, i didn't want to miss anything, so i made sure i took really thorough notes. though with a brain as small as mine, and such limited arms there were a few points i made darren slow down... he also wasn't too pleased that i'd ask how to SPELL every third or fourth word (i'm still new to this writing stuff down on paper... a puter sure! it has great spelling skills it'll share with me... unlike paper sadly). however in the end, after many delays and darren grumblings, i received a complete black belt level lesson in finding lost quarrys! to begin with what is a lost quarry? we also sometimes get what is called a mystery quarry. this is a former dig site we located for which no record or evidence was known. both are identified using different techniques, just in the case of a lost quarry we typically know who was doing the digging and often was they were collecting, but we don't know where. a mystery quarry is the opposite we know where the spot is, but have no clue (at first) who was digging or most important what was excavated there. 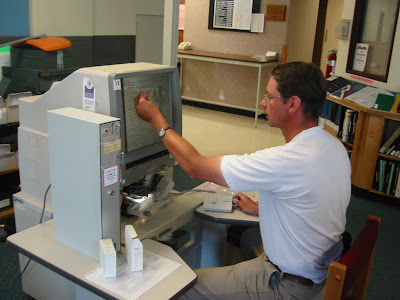 since the majority of digs that have occurred in alberta since the late 1930's have been relatively well recorded, darren hasn't had to do as much work keeping track of there recent digs. 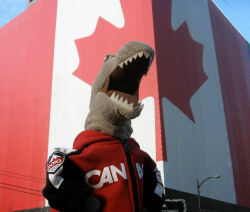 before that time though, especially in the excavation crazy era of the great canadian dinosaur rush, next to no information on where dinosaurs were dug up was kept. meaning we have hundreds of amazing specimens in museums, but we only know the very general area of alberta where they came from (and even a few we didn't get that!). 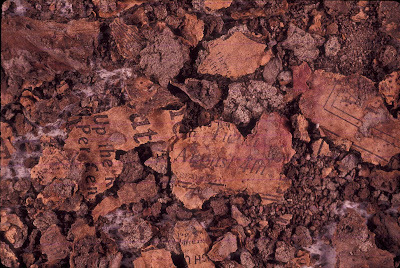 these labels on the back of some dig photos should give you a good idea of just how detailed location records were of these early fossil hunters. a "square butte east of sand creek"... there's only about a thousand buttes to choose from in any one area of the badlands! not to mention the overly helpful directions being just east as the only bearing! these pathetic directions are usually the best darren has to go on when looking for these older dig sites. if he's "lucky" they might "narrow things down for him a bit more by giving a vague distance with the direction. his favourite example being one site recorded as "7 miles east of steveville". as darren joked is that 7 straight miles? 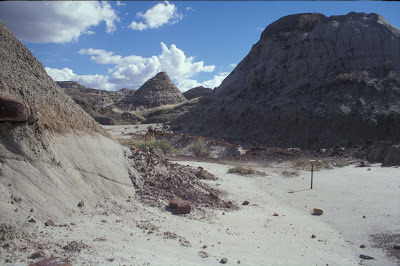 7 miles of walking directly or indirectly to the site (around the often difficult to climb badlands). is that due east? northeast? etc. if he were left with just the recorded locations, darren might be lucky to find 2 lost quarrys in his whole lifetime of looking. fortunately for him he is a smart cookie and as such has perfected methods that have led to him finding over 50 such sites... and he is still finding 2-5 of them each year! but why is it important that darren, and for that matter other palaeontologists, find out where these fossils were dug up from? now that we have the skeletons, isn't that all scientists need? in a word no, it is not enough. the science of palaeontology has changed a lot since the dinosaur rush. back in those days it was almost more about hunting for prehistoric trophies to put up in a museum, than hard science (though remember i did say almost. science was important, but not as much so as speed!). 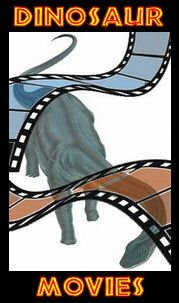 since this time, we've learned that to learn about the prehistoric past we need more than just the bones of long dead animals. the majority of information we can gain about them is exactly WHERE we find them in the ground. 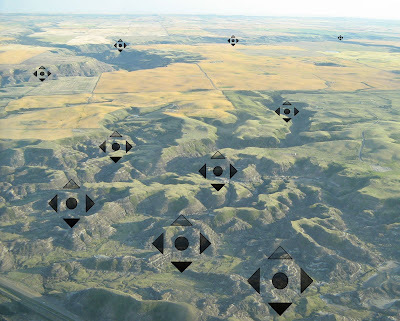 lets say you narrowed down our "east of sand creek" specimen to this specific hill in the badlands. in modern palaeontology for us to gain everything we can from the fossil we need to know the exact layer it was found in the hill. the reason is that each of those layers records a the specific era, geology, and environment. all these factors can tell us a great deal about how these animals (plants or what have you) died and quite probably lived (which is way more than just their remains. with only these all we can say is how it was put together). the era means the overall time that this layer, and the animal in it, were laid down. the higher in the hill you find the fossil, the closer to the present time it was laid down (we call this constant fact the law of super position!). if we know exactly which layers dinosaurs and other animals lived in, we can establish a timeline of when they lived compared to each other, and with this information exciting new insights into evolutionary changes can be tracked. environment, which is of course where the animal lived. granted a lot of how we learn about prehistoric environments comes from the just mentioned geology of the rock, there are other clues in layers beyond this. often more fossils are preserved in rock units. by looking at these other organisms (big and more often small) we get not only an idea of what our dinosaur was living with, but we can start to tell roughly what the exact environment of that layer was (compared to the other fairly similar but slightly different layers above and below it). due to darren's efforts it is almost like rediscovering dinosaurs that have been known for almost a hundred years all over again! 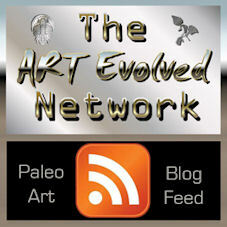 for example knowing that a dinosaur came from any one of these specific layers allows us to pinpoint those 3 factors. 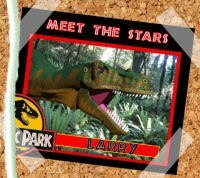 not only does this tell us a great deal about individual dinosaurs, but it adds to our understanding of their species. once we start comparing animals of the same type we can start to do things like narrow down exactly how long they existed, what sorts of exact environments they were associated with. if you combine information from the same layers we start to see the dinosaurs that co-existed with one another, and the ecosystems of that era take shape. 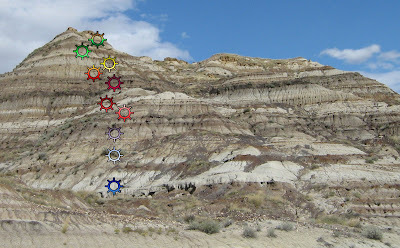 if we extend this and start to compare layer set to layer set we get to the watch evolution of these animals in a specific area (alberta) and the environmental changes that drove this evolution over tens of millions of years (as this province is lucky to have a nearly uninterrupted exposure of the last 20-15 million years of the cretaceous). how does darren find the lost quarrys to retrieve this vital information though? 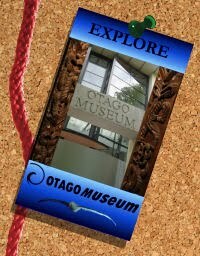 to do this darren exits the world of the palaeontologist who examine long extinct organisms, and he becomes something of an archaeologist interested in the activities of people in the past. which funny enough makes darren one of the few people that could be accurately called an archaeologist when he says he works with dinosaur bones (WAY too many people think that dinosaurs are worked on by archaeologists!). darren uses a number of clues to not only locate lost and mystery quarrys, but also pin point exactly when it was being worked, who was digging it, and what was being dug up. what are these clues then? for lost quarrys, darren is left with a photo or two of a particular dig, if he is lucky it will have a vague location or specimen type written on it (like the ones we looked at a moment ago "east of sand creek"). he might get both a location and specimen type and/or neither. yet as we shall see a simple photo like this is the most vital clue you could give darren for a lost quarry. not what is written on it! a tell tale sign of a dig for a unknown mystery quarry, is the left over bits of the materials needed to get fossils out of the ground. 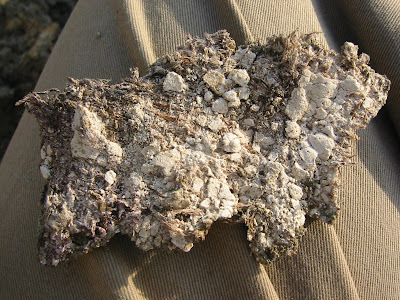 things like this pictured scrap of plaster in burlap smothered that didn't quite make it onto the field jacket (it happens all the time), wood timbers used as props and supports, and even sometimes digging tools. these are the least useful clues for darren, other than they reveal or confirm the presence of a mystery quarry. in most instances old plaster and timber can only tell him that though. he'll need more, like tools or better yet good old trash! fortunately for darren these old fossil collectors weren't big on not littering. 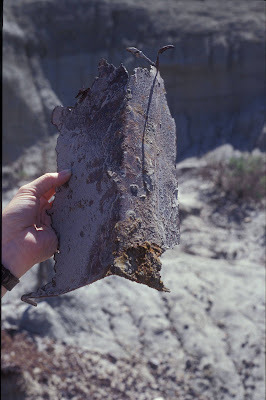 all the various bits of junk and trash they produced on their expedition often just got disposed of beside a dig, or better yet buried in the hole left after a fossil was removed. leaving darren with plenty of useful artifacts to help narrow down the site. back during the great dinosaur rush the only way to keep track of the greater world outside the badlands was by newspaper. so field crews were sure to stock up on them during supply runs. 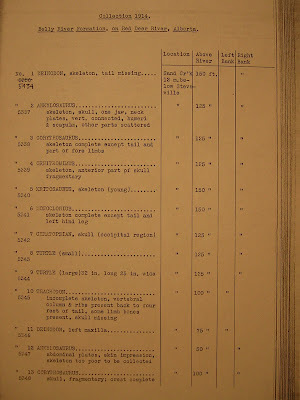 also back in those days the number of paper products available was much more limited then today. so newspaper had to be used for EVERYTHING. 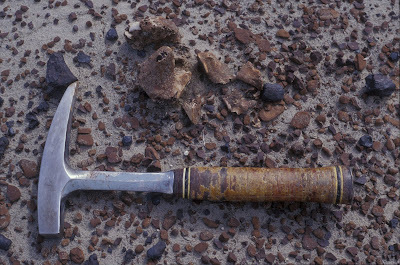 whether it be for use in field jacketing or toilet paper, these early fossil hunters left it everywhere. which is good, because as we shall see newspaper is perhaps darren's most powerful mystery quarry IDing tool! the last thing that often turns up while hunting lost and mystery quarrys is left over bits of fossil. 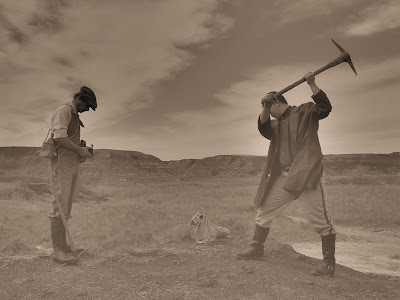 again as the first fossil hunters in alberta were typically hunting for as many museum quality specimens as they could, they tended to collect them as fast as they could and move on to the next find pronto. as a result they sometimes missed or left parts of animals behind. 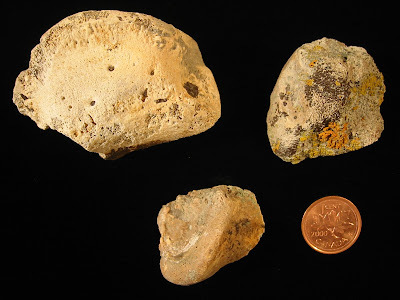 when darren shows up at these sites in the present, after nearly a hundred years worth of erosion, he'll find exposed bits of fossil that not only help him ID the site, but complete the specimens in the museum! however darren, with even just one or two of these things, has mastered putting together facts that lead him to the ID of a quarry. he does this much like a detective (which is what a palaeontologist should be!). a lost quarry- where the exact dig spot is. this is the key aspect. darren always knows who the main players are for these sites. though sometimes he doesn't know when the quarry was dug or what fossil was extracted from it. 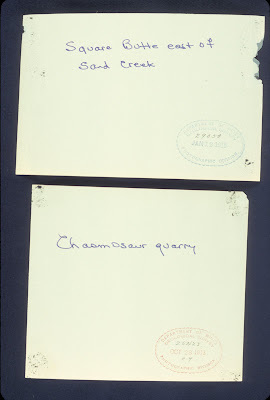 a mystery quarry- when the quarry was dug, who was digging it, and what fossil was acquired from it. all he knows is in these cases is where the quarry is located. though these seem like drastically missions, they actually tend to blend together. lost quarrys in many ways are easier, as darren at least knows whose dig he is looking at, but they still can need a lot more detective work than this. if that is the case they are only slightly different from a mystery quarry. the trick to these photographs though is finding them! to do this darren simple picks photos taken around an area he is doing field work in, and keeps his eyes open. which might sound like a long shot, but field crews move a lot during an expedition, meaning you can cover a lot of ground. travelling between field camp to a current dig or simply wandering around prospecting for new fossils, by keeping his eyes up and recruiting other team members to do so as well, darren has been quite successful! the great thing about these photos is there is a lot of them, and they were taken as though they had darren in mind. which isn't of course true. 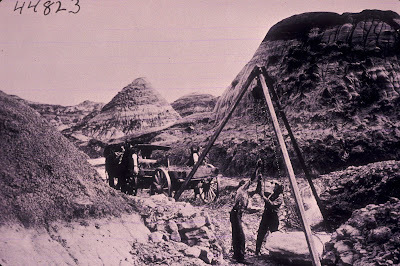 in reality, a hundred years ago the badlands were still a far off and exotic place to most people (other than tough rugged pioneers) just like the dinosaurs been dug up. so the photos were taken to capture as much of the majestic badlands as possible. meaning nearly every shot of a dig has a perfect skyline for darren to reference. the only set back he has faced using such photos, is that back in those days, photos weren't developed on your computer or at a camera shop. rather they were done by hand. meaning that mistakes could be made and a photo could be mirrored (aka flipped) so that it was backwards. meaning that unless darren enters a mirror universe (i sure hope not! they're almost always occupied by evil versions of everything!!!) he's not going to spot the landmarks in such flipped photos. so after learning from a couple of these (as one should from their mistakes) darren now carries two copies of any photo. one original and one mirrored. what is one man's trash is another's treasure. this couldn't be truer than with darren and quarry garbage. 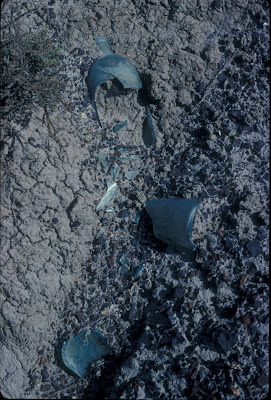 by taking things like shattered bottles (pictured here), old gas cans, food cans, and old packing crates darren can use these to pin point the date of a particular dig. back in those days most products weren't made uniformly like they are now. instead every area had its own unique brands and product types. also unlike today, they weren't mass produced as easily either. usually every few months, a couple years at MOST, the product line had to be changed. meaning that if you bought a bottle of soda pop in 1910 and than went back for another in 1911 it'd come in a different bottle (but usuaully just slightly different). 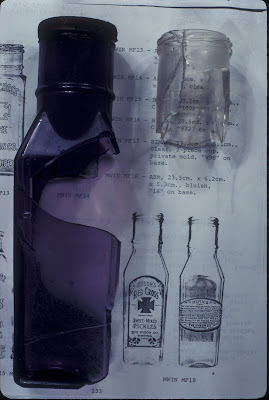 due to these differences, darren referencing his trash against antique catalogues (a catalogue is in the picture beside the bottle), the exact era of items is pretty easy to narrow down. it also means he knows where it was manufactured, and as each team of the dinosaur rush had different supply centres it can allow him to see whose trash he is looking at (if he doesn't already know) if it from a team's unique supply lines. as these field teams wanted to maximise the amount of bones they could ship back to their home museum, rarely did they take light gear back with them season to season. especially in lack of the reuse attitude of today. so darren seldom has to worry about items of an older vintage showing up after their period of production (which is supported by the majority of his quarry cases so far). one of darren's biggest obstacles in the start of this whole project was the lack of comprehensive catalouges of such items. over the years though darren has built up his own custom catalogues that cover the majority of what he runs across, and he simply researches any new items and adds them to his personal archive. 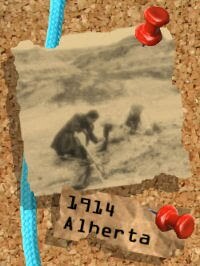 he also sometimes gets ubber lucky, and will find an object captured in one of his lost quarry photographs. when this happens, like this glue bottle he found in several pieces, it makes it ridiculously easy for him to confirm a site. in the end what darren is after with the garbage is the date of the dig, vicariously through the trash, and a point of origin for the artefact. as both these factors can help him figure out not only when the dig was, but who it was. with these as we shall see he can often determine much more by extension! if you thought photographs and garbage told us a lot, they have nothing on newspaper. sometimes ALL darren needs is a tiny scrap of newspaper like the one picture here (ACTUAL SIZE... seriously that small!!! ), and he can solve the toughest of mystery quarrys. mind you i said sometimes. the method is actually quite similar to the previously discussed garbage, only newspaper is so much more revealing. it can not just have a date printed on it, but a newspaper has an absolutely specific day it was printed on (not just year!). further more they are locally printed, and the field teams sought their home cities papers whenever possible. meaning if it is a none alberta paper it is easy to figure out whose it is). lastly there are complete and easily accessed archives of EVERY newspaper issue ever printed of nearly any newspaper darren might find in the field. 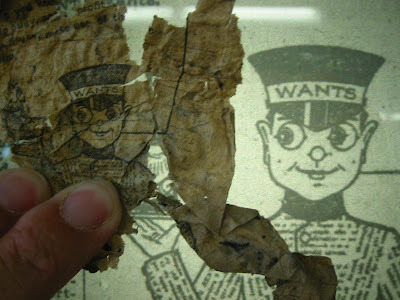 meaning if he can ID a newspaper fragment, he can determine all sorts of information. 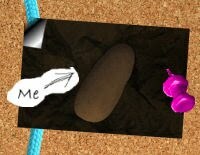 his biggest problem in the beginning was taking a tiny fragment like that in the picture, and figuring out which paper it came from. 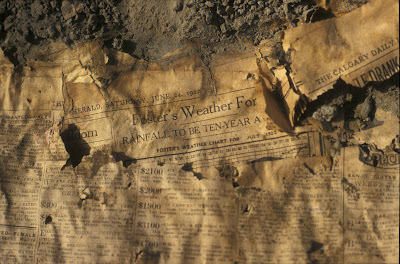 often you don't find intact newspaper pages from the dinosaur rush in the badlands (though sometimes darren gets lucky), more often just the eroded and buried remains of old papers (ironically similar to the dinosaurs he is hunting for). over the years darren has developed a legendary ability to ID newspapers. show him a bit of any new york, ottawa, toronto, or calgary area newspaper from 1908 through 1920 and darren can tell you not only which one, but what year! before you panic, he is not psychic. rather due to years of scouring newspaper microfilms and internet archives darren has picked up on the various components that made these newspapers unique. again because there were no computers or digital printers back then, each newspaper had to layout by hand the words and pictures on plates. due to this human touch, every paper had its own unique font, spacing, and layout. as elements in the print press wore out and staff were replaced things changed with every change. meaning if you look at the font, spacing, and layout elements from issue to issue of the same paper they tend to vary noticeable, that alone between different papers! as darren's been doing it a while now he has most of them memorized!!! i know... i wish my brain worked that well! once darren figures out the specific paper and issue he has two key pieces of information. the specific issue date. with this he knows that a dig could not possibly have occurred before that date. additionally he can usually determine which dig team based on where the paper was printed (minus calgary as that was the local paper that all the teams had access too while in the field). we'll see how these all come together in a moment. 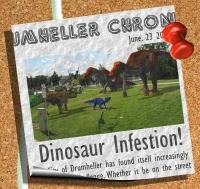 now of course the innerweb didn't exist during the dinosaur rush, but darren is adapting modern tools to figure out old mysteries. 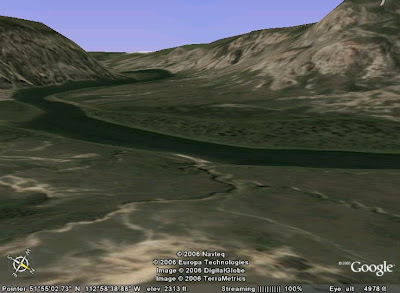 by using digital maps like this one on google earth, darren has been finding old quarrys and field camps from the comfort of his own home! by matching some of the 3D topography on his monitor to the photographed terrain in some of the old photos darren has met with some of his greatest recent successes. now we've seen what darren is looking for and how he uses it, but how does he put it all together? while out in dinosaur park, darren and company stumbled across this old quarry. you can partially tell by the unnatural slump in the hill, even if the erosion of 90 years has made it look natural! well okay that, and more obviously there was a bunch of eroded lumber scattered around in front of it. of course darren had no idea who was digging here, and as of such no where near knowing what dinosaur once was buried here... at least in the first few minutes of finding it! he wasn't without clues though. unusually they came from a paper darren couldn't immediately identify. not that this would stop him, but it meant he might need to find some further clues. which he found easily. among these were some dinosaur digit bones that had eroded out of the quarrys back wall (which 90 years ago would have proven tricky to extract without a lengthy time extension to the dig for just a few tiny bones). don't forget the newspaper or dinosaur... we'll come back to them in a second. darren also found this broken chunk of a gas canister. here was something he could work with right away in the field! for you see, in a previous lost quarry case darren had found a more complete example (dare i say... specimen! isn't this eerily like talking about a fossil find) of such a canister. thus he knew the brand, and more to the point the exact production model! 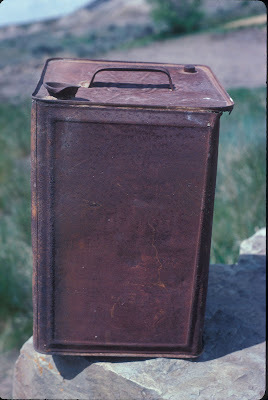 based on this "type" canister, darren now knew with some certainty the dig was around 1914. as the type can had been found in association with a barunum brown site, darren thought it was likely that the current mystery quarry was another brown site from the same field season. that's where the newspaper came in. however this was one of the trickiest newspapers darren had ever encountered. it wasn't from any of the usual places. meaning either he'd have to somehow figure out which paper it was from or be forced to randomly search every newspaper outside the normal places' from 1914 (which is every city and town on earth minus 5-6!!!)... so its a good thing he knew the year than right, you're thinking. you thought wrong! this is darren tanke we're talking about! on one of the pieces darren found a mention to a name. 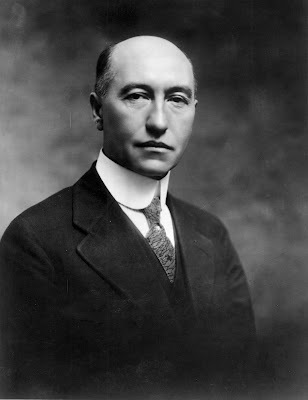 typing in the name and 1914 on the tiny chance it might provide a clue, darren was instantly rewarded with a result on an american diplomatic appointment to winnipeg, canada in that same year. 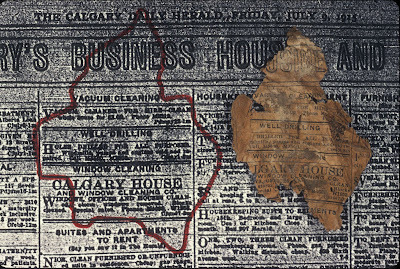 knowing this was more than a coincidence, darren referenced winnipeg newspapers from the summer of 1914, and quickly came up with a match (as seen in the picture above). now that he had both an exact date from the paper (which he was led to by the previous gas can evidence) and a city it was acquired in, darren could finally get to solving this quarry for good. none other than the infamous barnum brown. who of course darren had suspected as of the gas can, but now he had solid leads. 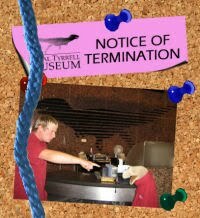 the only question remaining was which dinosaur had mr. brown dug up from darren's current lost quarry? which of course darren could tell were the toe bones of a ceratopsian dinosaur (ceratopsians are darren's favourite dinosaurs!). 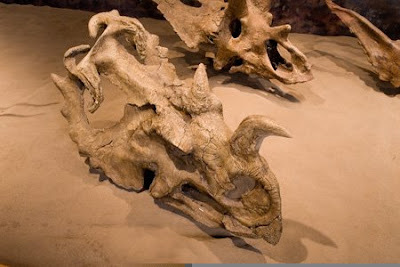 a rather lovely centrosaurus skull. though darren was able to rule this out quickly. the reason being the mystery quarry in DPP was far too big for just a skull. 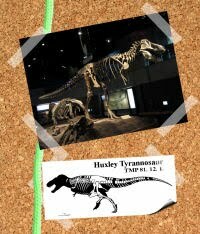 none of the dinosaur rush team's would have wasted time opening a quarry of that size if just the skull were found. this rather lovely centrosaurus skeleton. nearly complete from head to toe... which was the problem for darren. complete from head to toe. it had toe bones. this skeleton apart from some vertebrae was complete. it couldn't be his mystery quarry's occupant. another lovely centrosaurus... or if you're into brown's interpretation (i'm not myself) the type specimen of monoclonius nasicornis... skeleton. again nearly complete head to tail. wait you say. traumador did you just change you're saying? shouldn't it be head to toe? ah you caught me good people of the web wide world. indeed. this centrosaur was intact except for the TOES on the left rear foot!!! of which darren had a few! meaning that after his figuring it out, darren had helped completed this skeleton even more! now of course the clues are always different, and not always necessary (like the wooden timbers at the start of this mystery quarry), but through common sense and good old deduction and research there isn't many lost or mystery quarrys darren tanke can't crack! when i say many, there is one exception. the quarrys of francis slate. there are several lost quarrys of his out there still to be found, but as of yet only two have proven findable. darren was very appreciative of my enthusiasm for wanting to help, but cautioned me on the difficult nature of tracking slate's operations (both he and craig had tried for a long time, and only come up with 2). darren handed me this photo. it was his top wanted slate site. 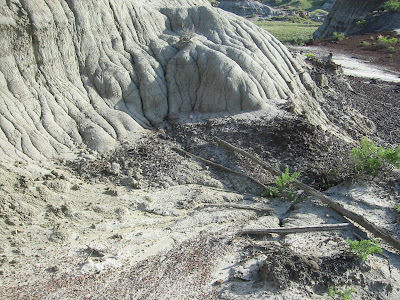 slate had recorded the presence of a fossil bed with multiple theropods. i looked hard at the photo, and thought to myself, no matter how hard history had tried to hide francis slate and his work... i was going to try even harder to find it! next: the hunt for slate begins!!! 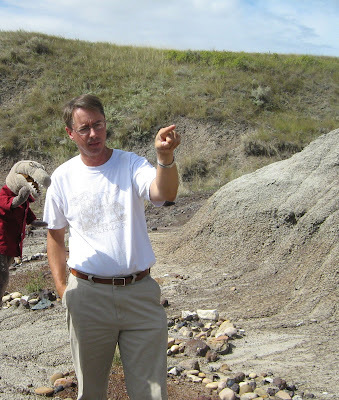 Darren Tanke is the "Sherlock Holmes" of Fossil Quarries. I'll have to remember the lessons in these post this summer when I'm with Horner. 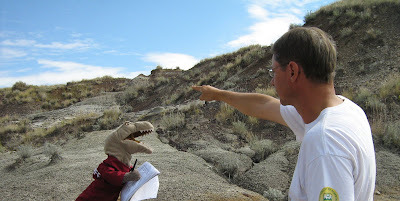 One question for Darren Tanke: "Do you do any prospecting for just fossil specimens like other paleontologists?" Alright now, Traumador. Got to pick your brain for a minute. What do you think of Brown's Monoclonius? It's never cited anymore, and the one remaining skull still assigned to the genus was lost (I think) or badly incomplete. 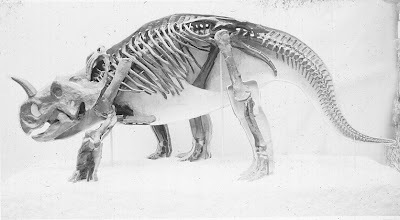 The current trend is to call Monoclonius a "young adult" stage of some generic centrosaurine. Brachyceratops is the juvenile stage, of course. The fact that everything once called Monoclonius is now reassigned to Centrosaurua gels with this idea, but a part of me likes to hold on to Monoclonius as a valid taxon. I grew up with him, you know? He stabbed T.rex in the shin in that Christopher Reeve PBS special. raptor- don't have to ask darren to know the answer. he most certainly does still look for normal fossils. again, he does both at the same time. which as you walk through the badlands fossiling it can be bad for your neck. if you just fossiled, you'd seize up your spine. so lost quarrys are a good way to loosen your neck up! ah monoclonius... one of the ultimate problems for any ceratopsian scholar. my quick opinion is that monoclonius is a classic waste basket like megalosaur, and despite the number of species it is a useless genus. cope did the world good by IDing the first certopsian if from really incomplete reamins (he of course thought that the frill was a weird shoulder girdle). now brown's monoclonius is based on much more solid remains, but to me it resembles centrosaurus (named before brown's species). there are those who'd argue there are some monoclonius that are different, but i'm not sure i agree. to me they're either dimorphic variations of other local centrosaurids, and/or a growth stages of these centrosaurids. as darren has found with the pipestone creek pachyrhinos, their young look really similar to other centrosaurid young until the horn grows inward. it makes sense to me that those centros whose horns don't ingrow that they'd all look the same till they matured and developed their different ornamentation. So it was a stupid question. Sue me. niot because your question was stupid mind you... i didn't say it or you were stupid (which considering my mental capabilities would be like calling the kettle black). i just worded it that way as to actually ask darren would take a little while at moment is all. Yeah, my gut tells me that Monoclonius is a wastebasket. Really a shame, too. I always liked that name. so it was Barnum Brown! paleontologists have to be really sherlockholmish! 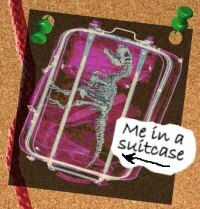 LOL Raptor Lewis got he same idea that came to my mind! I stil have some old dinomagazines/books featuring monoclonius! 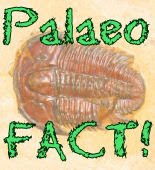 Click on this Logo to find out Cool Prehistoric Info! Thanks for stopping by, and hope to see you again real soon!